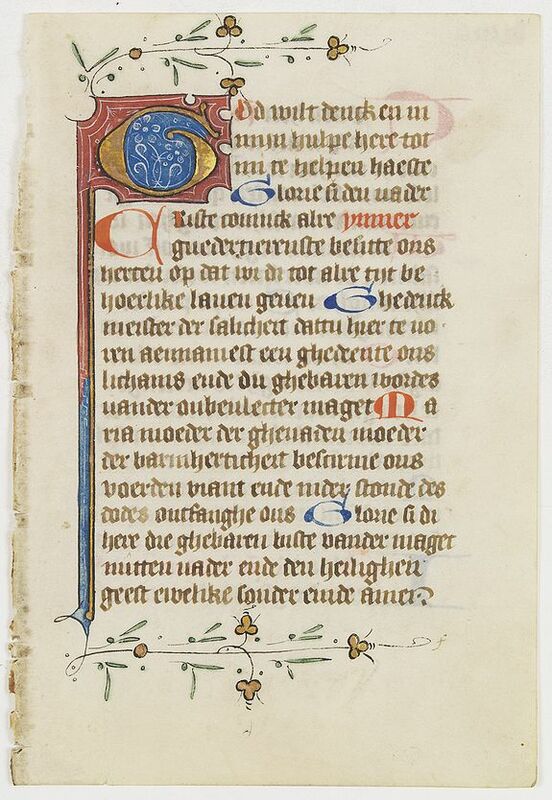 BOOK OF HOURS - A manuscript leaf from a Dutch Book of Hours. Title : A manuscript leaf from a Dutch Book of Hours.. Date : Northern Netherlands, Holland, ca. 1450. Size : 6.0 x 4.2 inches. / 15.2 x 10.7 cm. Description :RECTO: One 4-line initials in burnished gold on coloured grounds. Colourful border extension of the initial G. One 2-line initial in red and four one line initials in red or blue. VERSO: two 2-line initials and six 1-line initials in red or blue. 19 Lines of text. Condition : 19 Lines of text in Dutch, written in a brown late Gothic book hand.